The old lady of Pythagorion. I thought about asking a few store owners, but I never got to find out how old she was. 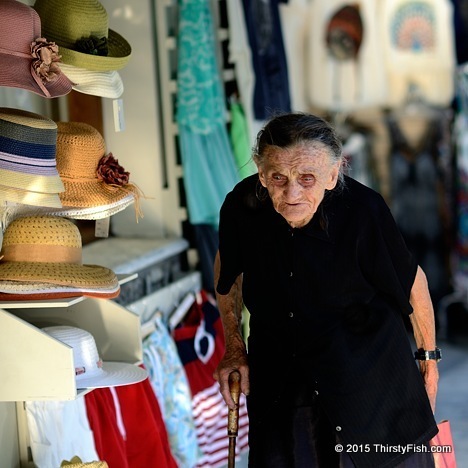 Totally self-sufficient, and with piercing eyes, I saw her shopping and walking around every day I was in Pythagorion. God bless her. Pythagoras was from the Island of Samos. His teacher for "moral doctrines" was the Delphic Priestess Themistoclea. Pythagoras was involved with a female philosopher named Theano, who was either his wife, his daughter or his pupil. Theano wrote about the analogy between numbers and objects, the golden mean and the application of Pythagorean philosophy to a woman's life. It seems, women in the Ancient World were more respected than they are even today - at least in some cultures.